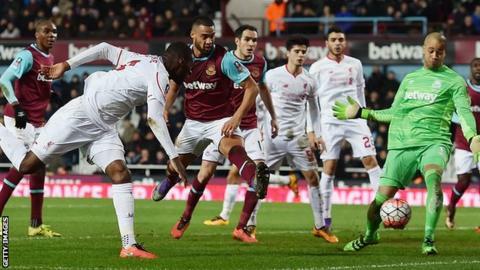 West Ham and Liverpool could face a play-off to determine who qualifies for the Europa League. The Hammers lie sixth in the Premier League before the final round of matches, while Liverpool are eighth. The Reds also play Sevilla in the Europa League final knowing that a win would secure a Champions League place. If they have to qualify for Europe through the league, there is a scenario that has both clubs level on points, goal difference and goals scored. West Ham would have to lose 1-0 at Stoke City AND Liverpool beat West Brom 2-1; or the Hammers lose 2-1 while it finished 3-2 to the away side at The Hawthorns, or so on. In addition, seventh-placed Southampton would have to be denied a win against visitors Crystal Palace. Those scorelines would leave the London and Merseyside clubs level after 38 matches of a season lasting nine months. If they were tied, the play-off would only be needed if their finishing spot is in a Europa League position, and Sevilla were to win next week's final in Basel. A Premier League spokesperson confirmed an extra game could take place, although the likelihood is small. Any date or ground has not been decided upon. Manchester City are already assured of at least a Europa League place after winning the Capital One Cup. If they finish in the top four, that place in the Europa League third qualifying round will pass to the sixth-placed team. The same will happen if they secure a place in the Europa League group stage by finishing fifth - and realistically, goal difference means City are unlikely to finish lower than fifth. If Liverpool win the Europa League, they will qualify for the Champions League group stage. If Crystal Palace win the FA Cup, they will enter the Europa League at the group stage. If Manchester United win, that place will be given to the seventh-placed team. There are no longer any Fair Play places allocated to the Europa League.